The Department of Mathematics at the TUM is delighted to welcome new graduate students who are interested in being part of an academic community known for its outstanding research teams and scholarly cooperation. The department offers a stimulating environment ideal for doctoral projects: from its courses and staff to the very structure of the TUM Graduate School and its Graduate Centers, the faculty’s service has been designed to help its students succeed. The Dean's Office and the Graduate Office will support you at all stages of your graduate studies! Here you will find all players relevant for your dissertation project. Please note the details how you can make changes in your doc-gs account or request to be removed from the doctoral candidacy list. To hand in your dissertation you need to fulfill a 2-year-membership in a graduate center of TUM GS, e.g. ISAM. Although colloquially speaking you are interested in receiving a PhD, the department awards only the title Dr. rer. nat., not PhD. The doctoral regulations are the legal basis for your doctoral procedure. From a legal perspective, each doctoral candidate officially belongs to the Department of Mathematics during his/her dissertation project. All enquiries relating to legally important administrative matters, such as registration as a doctoral candidate, dissertation submission, and doctoral examinations, should be directed to the Dean's Office. As a doctoral candidate in mathematics, each graduate student is a member either of the departmental Graduate Center ISAM or the Graduate Center most relevant to his/her dissertation topic. The individual Graduate Centers, all of which belong to the Graduate School, are responsible for general administration, student records, and special events. Further information can be found in the comprehensive list of graduate centers and staff. As a doctoral candidate at the TUM, each graduate student has various rights, obligations, and possibilities. 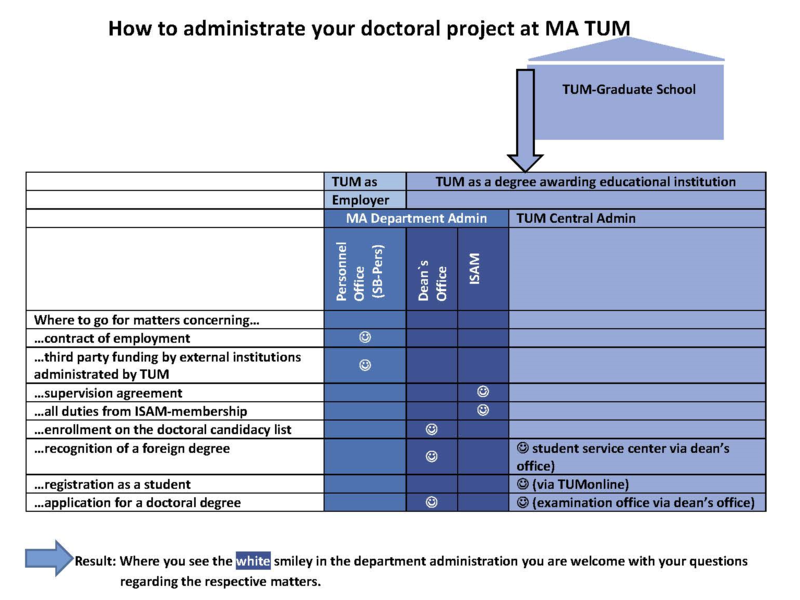 For all general matters concerning promotion, study and degree regulations, professional development opportunities, etc., please visit the TUM Graduate School. 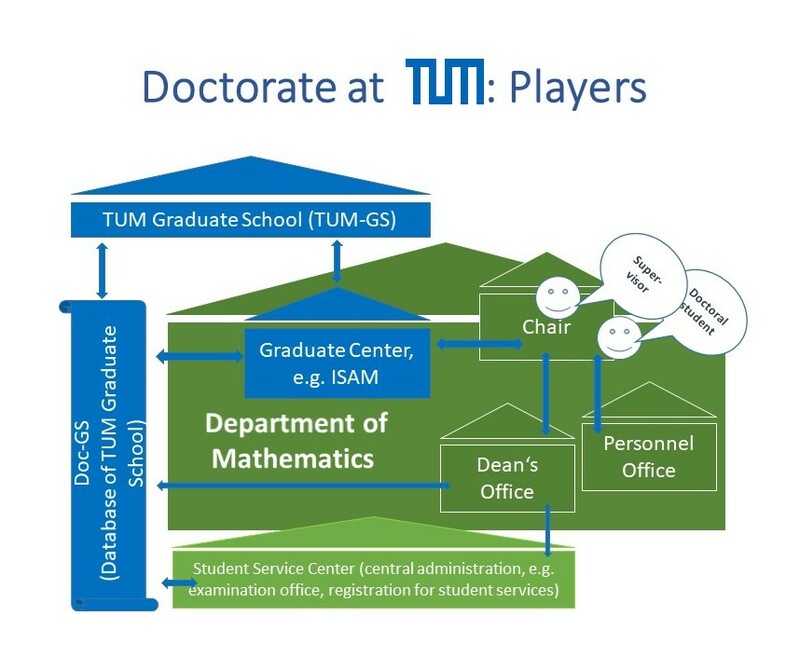 Each doctoral candidate registered at the TUM can enroll as a doctoral student for a maximum of six semesters. Please apply viaTUMonline. For support as scholars, doctoral candidates should look to their academic advisors within the department. Mentors and colleagues from the respective research group are also here to lend support in all matters of scholarly development. Doctoral candidates who are also employees at the TUM should consult the personnel office with all enquiries regarding matters of public sector employment law such as contracts, leave due to illness, vacation, etc. Doctoral students who are grant recipients should address any questions about related financial and legal matters to the provider of the grant. The doctoral examination office will be relevant for submitting your dissertation. The standard doctorate, offered at our department, is coordinated through the International School of Applied Mathematics (ISAM) If you are interested in applying to the programs TopMath or IGDK, there are important steps to be taken prior to admission. To fulfill the formal requirements for a doctorate at our department, you must have completed your master's degree or diploma with an above average grade. Applicants with a degree obtained from a foreign university must get a recognition to determine the equivalence of their degree. For information and advice concerning formal requirements, please contact the dean’s office. In order to be admitted to a standard doctoral program, you will need the supervision provided by a member of the Faculty of Mathematics. That's why we recommend external applicants to get in touch with a potential supervisor in advance, and present documents that support their abilities. If your dissertation topic is definite, fill in the supervision agreement together with the supervisor. You can find information on the required procedure under Graduate Office. In order to receive the status of an official doctoral candidate, you have to apply for official registration on the department‘s doctoral candidacy list. Please submit the application via the online platform DocGS. Applicants with a German degree: Please submit the documents listed here to the dean's office. Applicants with a foreign degree: Inform yourself about the recognition procedure, which is integrated in the application for entry in the doctoral candidacy list. Here you find information which documents you need to hand in as certified copies. According to the TUM doctoral regulations, any doctoral student has to fulfill the mandatory basic program during the promotion period. In the supervision agreement, you may declare further accomplishments to be achieved, such as scientific qualification, transferable skills, or international experience. Your graduate center will inform you about categories and requirements. For more information, see the instructions on Graduate Office. Interim evaluations are conducted after one to two years of work on the dissertation. At this time your supervisor will assess progress and help determine whether or not the dissertation should be continued in the planned form. For more information about milestones and benefits, look at Graduate Office. Once you have finished your dissertation, you can apply for your doctorate. Therefore you have to submit your dissertation first electronically through the DocGS platform and then as a paper. Please note that an upload is possible only after you have successfully completed the respective requirements. To submit your dissertation, please read the instructions carefully and direct all remaining questions to the Dean's Office.